You probably don't love the amount of cleaning time it takes to wash all of your little one's bottles and dishware, but with Munchkin's Suds Up Cleaning Sponges, we’re hoping to add a little LOVE into the routine. This convenient two-pack of sponges keeps your kitchen and bottles clean and smelling fresh! 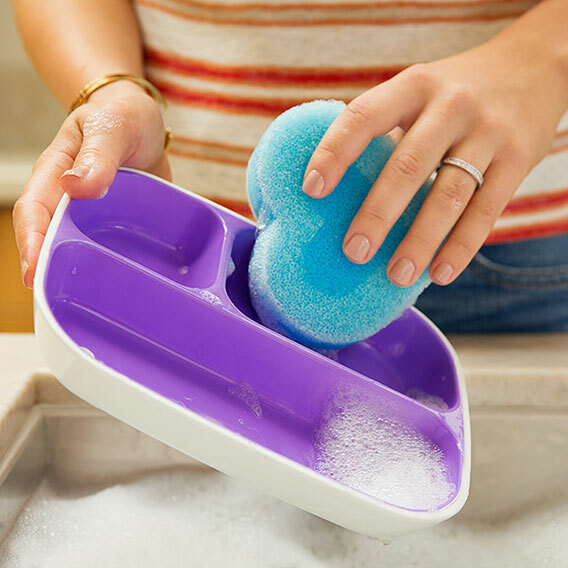 The sponge's unique shape and pointed tip makes it easy to hold and ideal for scrubbing those tough-to-reach crevices. Munchkin's sponge is soft enough to not scratch any surfaces, but cleans like you need it to. Let's hear it for labors of love!